Please join us for a “Fluent In OPIC™ – Getting financing and political risk insurance for your projects abroad” webinar series. This webinar will only be presented three more times this year. Please register for the date and time that work best for you. Sponsored by the Broad Street Capital Group, this proprietary complimentary webinar ($379 Value) will offer comprehensive “beyond the website” look on how to effectively utilize little-known programs offered by the Overseas Private Investment Corporation (OPIC) – a US Government Agency – to finance international investment and franchise transactions for US companies expanding abroad. The workshop will address the types of transactions and industries being financed. It will go over the application process, deal structures, sponsor requirements and commitments, approval procedure, realistic time frame estimates, costs, fees, legal and developmental issues. The workshop will also examine various options for protecting investment through effective use of political risk insurance. ALEXANDER GORDIN, Managing Director of the Broad Street Capital Group and Creator of the FLUENT IN FOREIGN BUSINESS franchise. …”Essential reading for any U.S business looking to expand into foreign markets. Informative and entertaining – personal insight and experiences make this a must-read if (and you should be) expanding into new territories…”Industry Today Magazine. Today is a very special day for me. After 23 months in the making, my book Fluent in Foreign Business has finally been released. In today’s post I would like to talk about the factors that led me to write this book and the benefits that I hope will accrue to its readers. I’ll also discuss the role played by the Princeton Council on World Affairs in producing this book and the entire business educational program that is aimed at those wishing to grow or start a business abroad or simply learn more about international business. What is the book about? 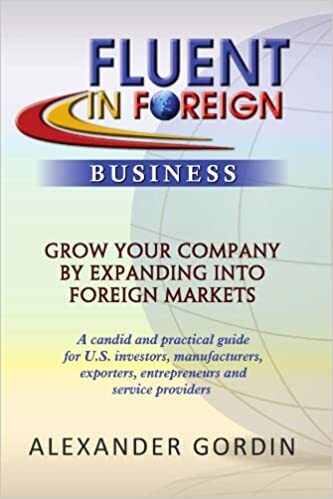 Fluent In Foreign Business is a candid account of my personal stories gathered during more than two plus decades of doing business overseas, with proven business concepts, risk management techniques and practical guidance. It covers a number of questions that will benefit any reader wishing to consider developing or growing their international business. The book will help readers avoid costly mistakes and save them valuable time and money. Furthermore, it puts the reader on the path of self-discovery and introspection and will help them understand how committed they really are in their quest. Students and those simply exploring the path of international business will find a number of stories that illustrate the dangers and the hardships, along with personal and professional rewards. Those already exporting to one country will learn how to evaluate and grow their operations into different markets. •Why do I want to take my business abroad? • How do I pay for it all? • They WILL be asking me to pay bribes; what should I do? • What pitfalls await me? •What happens when the proverbial s!&* hits the fan? In writing this book, there were three things I wanted to avoid – a technical textbook product, reader intimidation and boredom. Instead, I have tried to paint intensely practical and candid pictures of what it takes to do business abroad, what tools are needed, what support mechanisms are available, what dangers lurk and finally, what rewards await those who decide to go on the adventure. To help reduce the intimidation factor, I introduced an avatar named Global Felix™. Every chapter includes a situational illustration of Felix, making it friendlier and more accessible to the reader. Those of you who regularly read this weekly blog, or publications such as “Industry Today,” “Industry Week,” “Business Finance,” “The NY Enterprise Report” and the Wharton Magazine blog have had a chance to read excerpted chapters from the book over the past six months. Why did I decide to write this book? I truly believe that in today’s world, international business must be a component of every business (sans little mom and pop local enterprises). Regardless of whether it is export, direct investment or import, having an international strategy is key to long-term survival. I also believe that to succeed in doing business abroad, a special state of mind is required along with proper coaching, deep cultural understanding, a superb information network and a sober risk/reward assessment framework. This state of mind can be achieved through education, information and empowerment of business owners, managers and entrepreneurs. Thus, along with my like-minded colleagues, we have undertaken a quest to enable as many people as possible to succeed in international business. I also wrote this book to share my personal experiences and those of some of my colleagues. I believe these experiences serve as valid illustrations of what one can expect when doing business abroad. I have been fortunate to do business in more than 30-countries and I’ve encountered a wide variety of cultural and business situations, which I hope will benefit the reader. Despite the fact that the U.S. has consistently been one of the largest global exporters, a vast majority of American businesses remain focused only on domestic business. Such a myopic vision makes them susceptible to economic downturns like the one we are now experiencing, and it precludes them from taking part in the breathtaking growth of some of the world’s emerging markets. It also insulates them and undermines our country’s long-term competitive position. Enter the Princeton Council on World Affairs ( www.princetoncouncil.org ), a non-profit organization whose mission is to Educate, Inform and Empower its members, helping them succeed in their international business and economic development efforts. It is a young organization, which is part of the 90-year old foreign affairs monolith – World Affairs Councils of America. Led by a diverse and experienced group of Trustees and a very competent international Advisory Board, the Princeton Council has been an effective tool for its U.S. members who wish to enter various foreign markets and participate in complex multidisciplinary business opportunities. Over the last six months, the Princeton Council’s leadership has witnessed a very strong increase in cross-member activities where members and prospective members seek assistance within the Council’s membership roster to take advantage of opportunities in markets such as China, Africa, South America, Bangladesh, Jamaica and countries of Central Asia. Many foreign companies seeking to enter the U.S. markets have turned to the Princeton Council for guidance. Providing its members unparalleled access to government officials, corporate and civic leaders in multiple markets, along with numerous other education, business development advisory and cost-saving benefits, the Princeton Council has rapidly emerged as one of the most effective platforms for international business expansion, economic development and education. On June 30th, July 7th and July 21st between 5 and 8pm, the Council will host three “Is Your Business Fluent In Foreign?” receptions in New York, Washington D.C. and Princeton, N.J., respectively. These receptions will feature important speakers from Ambassadors and U.S. Government officials to international corporate practitioners and industry leading lawyers and journalists. The presentations will offer high-level networking opportunities, surprise performances and the chance to learn about how to grow their business through exports, insure against political risks, participate in international infrastructure projects and contribute to international economic development. Please Save the Dates and watch your email for upcoming announcements and for your personal invitation. For the remainder of May and the entire month of June, the Princeton Council is having its annual Membership Drive. All those who purchase Fluent In Foreign Business, either on Amazon.com http://tinyurl.com/3gf4oeq or through the Princeton Council website (www.princetoncouncil.org) between May 21st and July 1st, will receive a 90-day complimentary corporate membership, a $625 value and a 20% discount on all corporate training and advisory offerings for the duration of the membership. As part of the birthday celebration, the Council is upgrading its Websiste to be unveiled June 1st. Princeton Council members can enjoy exclusive access to diplomatic hotel rates at some of the leading hotel chains throughout the U.S. and in many foreign countries, with discounts up to 40% off the regular rates. Members also enjoy weekly geopolitical intelligence briefings from Stratfor, access to exclusive international business opportunities and industry alliances, deeply discounted publication subscriptions including “Foreign Affairs” magazine, reduced rates on language training and translation courses, as well as Berlitz’ proprietary Cultural Navigator ® system. Additional benefits, of course, include proprietary educational offerings from the Fluent In Foreign Academy™, member only business & foreign affairs networking events as well as high-level market entry access and advisory services. Every book purchased through the Princeton Council during the membership drive will be autographed by me. As a way of giving back, I will be donating 20% of the proceeds of every purchase via the Council to the U.S. Tornado Disaster Relief Fund to help the victims of the tornadoes in our Southern states. To arrange for corporate purchases or any service issues please contact kgigineishvili@princetoncouncil.org . My colleagues at the Princeton Council on World Affairs and I are deeply committed to international economic development and foreign affairs issues. We will continue to do all we can to help facilitate economic development and seek out international business opportunities for our members. I hope you enjoy the book and I welcome your comments, reviews and suggestions. Also, I look forward to meeting all of you at the upcoming Princeton Council events and during my promotional book tour. For event sponsorship information, conference or corporate function speaking engagements, to arrange a private book signing or advisory assignment, please contact Bambe Levine or David Reich at 212 490-6500. I can be reached at agordin@broadstreetcap.com or agordin@princetoncouncil.org .